The institute builds new programs based on the success of past programs. The institute has demonstrated past program success. The following is a selection of past program descriptions, histories, and outcome highlights. The program assisted 133 communities and 305 companies. Projects impacted 13,555 jobs and contributed to 662 new jobs. Company participants represented $5.4 billion in sales, and the program helped firms generate an additional $183 million in new sales. Along with new sales and increased employment, the program sparked new innovations, including 139 new products and 26 commercialized technologies. The program produced an 18 X return on investment for its funders. The automotive industry crisis of 2008–2010 was a part of a global financial downturn forecasted by institute economists. 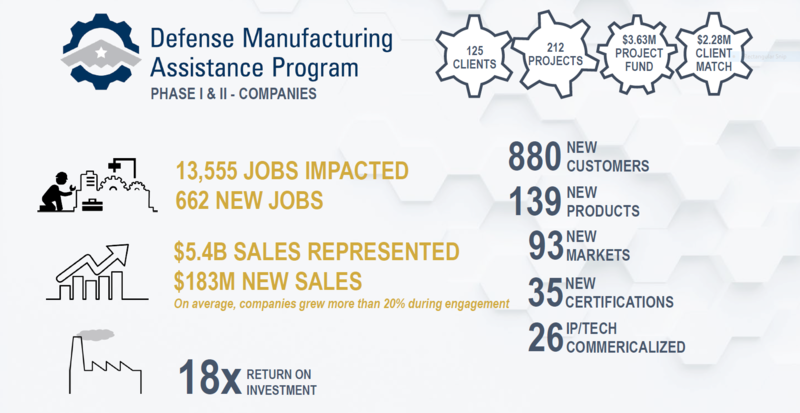 The institute rapidly developed the Automotive Assistance Program (AMAP) to help second- and third-tier suppliers of components, materials or parts to automotive OEMs who were financially at risk or likely to be financially impacted because of the automotive downturn. The program was part of the TAAC program, but required no proof of import impact. It consisted of three phases: client assessment and review of 2 years of financials, sales, and employment information; diagnostic analysis and adjustment plan delivery; and project implementation. AMAP project manager set the precedent for future programs by working with companies to develop realistic strategies and actionable recovery plans. with specific project scopes. AMAP helped grow a foundation for future programs by using project managers to select and leverage outside technical, private sector consultants to implement projects. The AMAP helped lessen financial and job losses and supported manufacturing employment. 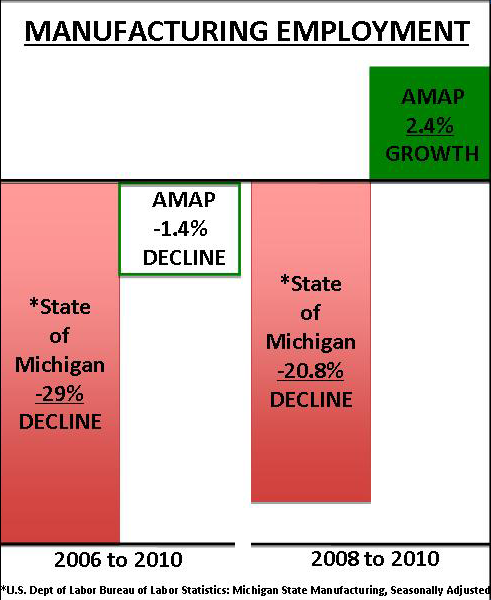 AMAP clients demonstrated 2.4% employment growth from 2008 to 2010 compared to the -20.8% statewide decline in manufacturing employment. The Center for Labor and Community Studies at the University of Michigan-Dearborn incorporates the Labor Studies Center, which was formerly housed at the institute in Ann Arbor. The center provides additional programs, research, seminars, and other activities for the community. The Labor Studies Center in Ann Arbor opened in 1957 and has been providing educational offerings in the fields of labor relations. The current staff is dedicated to adult education that empowers students. The program supports community development in southeast Michigan to keep pace with the changing global economy. The EDA University Center for Economic Diversification was one of 50 centers funded by the EDA and the U.S. Department of Commerce. The EDA-supported University Center (UC) program marshaled resources for 26+ years from colleges and universities to support regional economic development and diversification strategies in regions of chronic and acute economic distress. The program at the University of Michigan had one main goal: to assist communities and companies to become more innovative, flexible, efficient, and globally competitive. 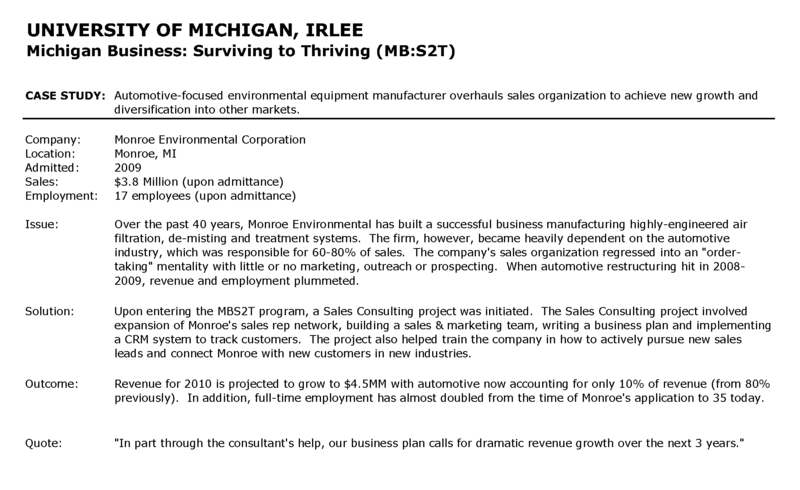 Services were applied to Michigan communities and businesses including a feasibility analyses, market analyses, strategy implementation, operations planning, and impact and performance analysis in five different areas: economic diversification, industrial facilities revitalization, minority business development, professional education and training activities, and international exporting and global competitiveness. The EDA University Center demonstrated the University of Michigan’s commitment to serving the public as a community and business engaged University. The institute’s University Center led a number of demonstration projects that facilitated economic recovery and transformation, such as the EDA Community Economic Adjustment Program. Small business incubators were established with the assistance of the University of Michigan EDA University Center including the the Harrisville Arts Incubator, The Mexicantown Mercado Incubator, the Ann Arbor Innovation Center and ‘kitchen’ incubators (Food Works Kitchen Incubator in Huron and The Starting Block in Oceana County serving the West Michigan Region). The Center conducted research in the food system industry sector of the State of Michigan economy to identify opportunities for new ventures to be launched and opportunities for job creation associated with the value added processing of food products. Through these projects, the EDA University Center’s ideas, processes, and resources were used to develop replicable and scalable models for other institutions as they work to build more resilient, innovative communities. Partnerships with other university centers across the region allowed the institute to share resources and ideas and work together to enhance the collective capacity to serve communities. An example of technical assistance provided to firms was the assistance provided to the ReCellular Company, the largest re-manufacturer of cellular phones. The University of Michigan University Center provided a faculty member from Industrial and Operations Engineering to help improve production efficiency with a Ph.D. engineering student and an additional production assistant. ReCellular was sold to a Texas-based company for nearly $3 million in 2013. Lastly, the EDA University Center laid the groundwork for future institute programs with community economic engagement scopes of work including but not limited to the Center for Business Acceleration and Incubation Studies (CBAIS), Community Economic Adjustment Program (CEAP), and Defense Manufacturing Assistance Program (DMAP). 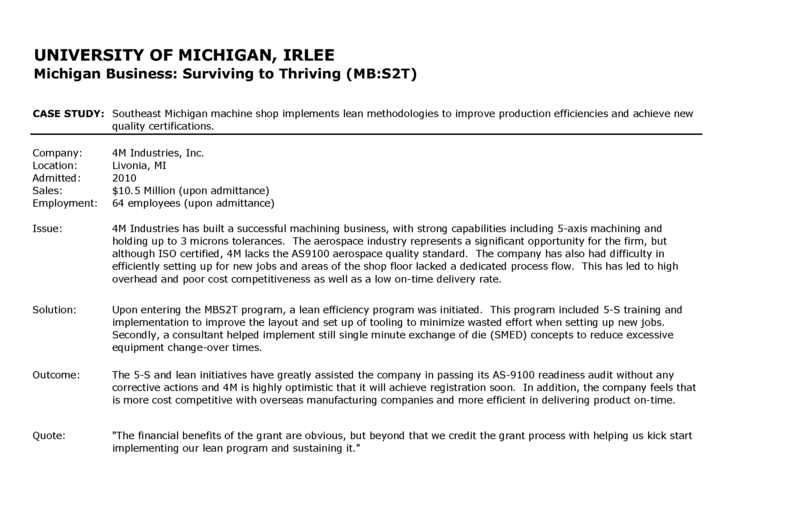 MB:S2T was a state-wide layoff aversion program that evolved from AMAP to foster the growth of Michigan businesses and the strengthen the Michigan economy. 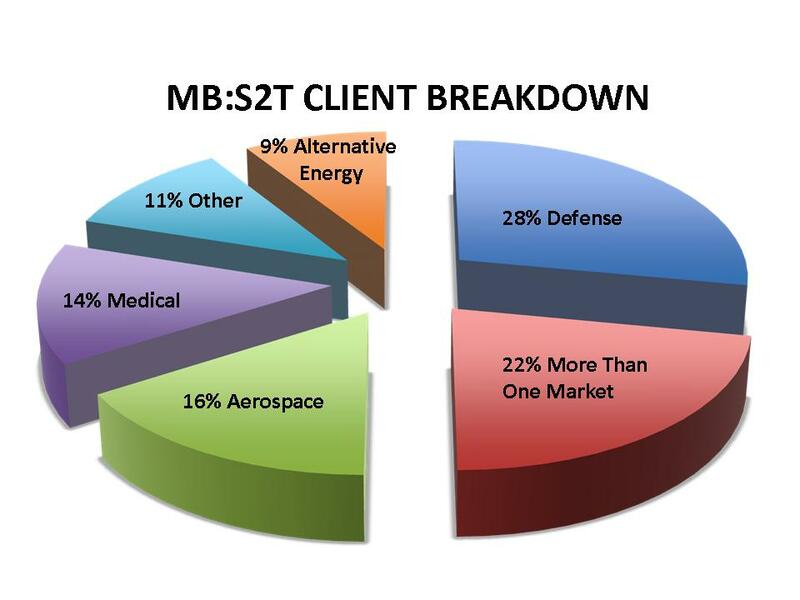 MB:S2T provided customized technical and management services to at-risk firms on a cost-share basis. 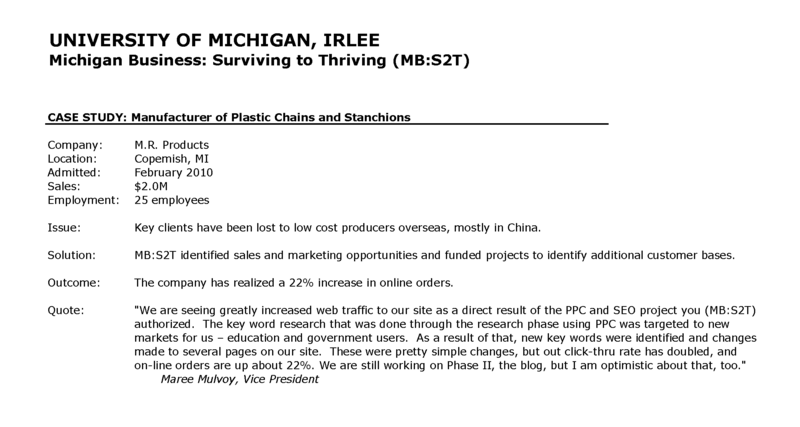 MB:S2T helped identify vulnerable firms, assess their operations, develop an adjustment plan, and provide implementation support to help Michigan businesses compete in a global market by improving profitability, averting layoffs, and creating opportunity for diversification and job growth. Key program strategies and projects focused on market diversification, new market penetration, and product diversification. 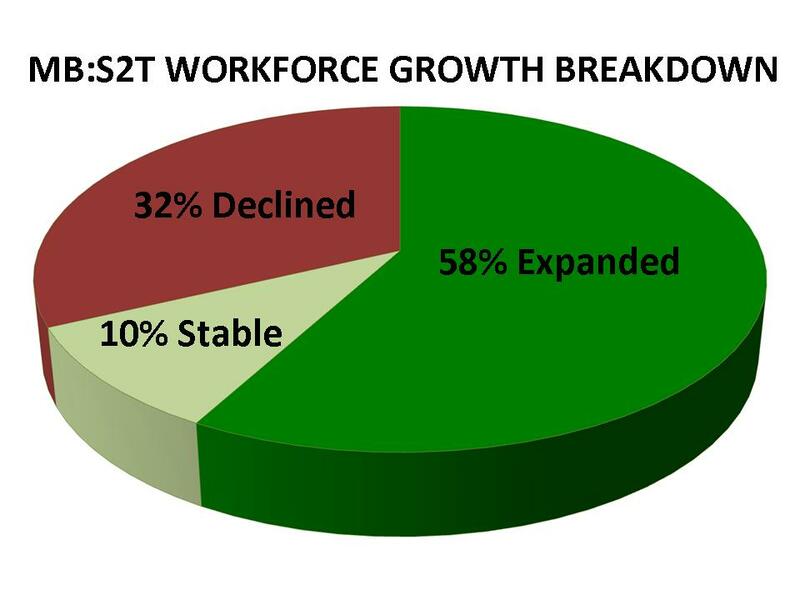 MB:S2T helped clients create new jobs, retain jobs, and reduce sales reductions and losses. The MB:S2T Program supported projects and initiatives with 133 companies. Of these projects, 88% focused on market diversification, 55% on new market penetration, and 9% on new product development. 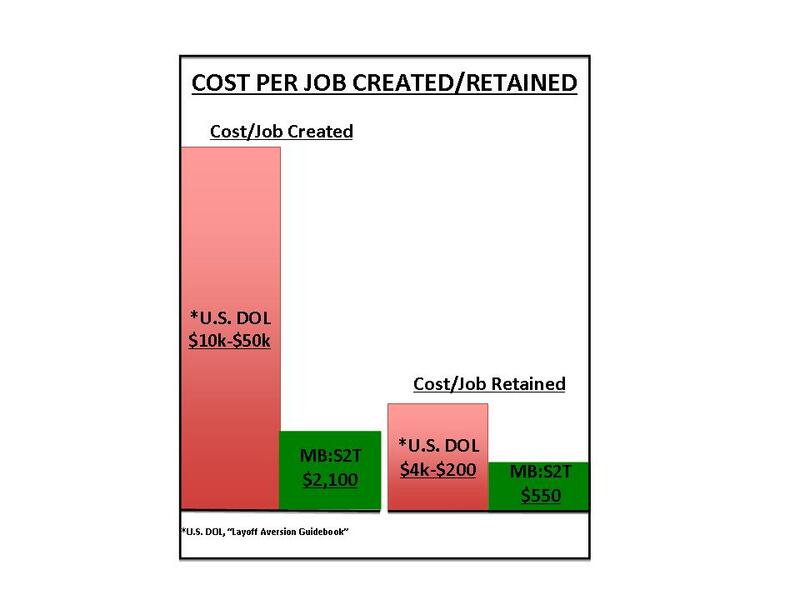 The program achieved significantly lower average cost/job created ($3,004) and average cost/job retained ($290) compared to US Department of Labor Layoff Aversion Guide standards ($10,000-$50,000 and $200-$4,000 respectively). In 2012, NEXCAP was funded by the USDOC and EDA to develop an inventory of closed manufacturing facilities, starting in Michigan, Ohio, and Indiana, for a nationwide catalog. The institute launched NEXCAP to help identify demand for hundreds of millions of square feet of un-utilized manufacturing space. Detailed site/facility, community profiles, available resources, and analyses of local community conditions were developed for each site and local region. These profiles were entered into a web-accessible database. NEXCAP connected companies with specific needs to communities for the purpose of putting closed plants back into production and creating new jobs. NEXCAP’s site inventory and portal populated with detailed profiles of the facilities and their host communities provide companies seeking locations with a toolkit of information to guide their business location and/or expansion decisions. At the same time, NEXCAP offers communities negatively impacted by the manufacturing downturn a venue for discovering new users for their vacant sites and facilities.